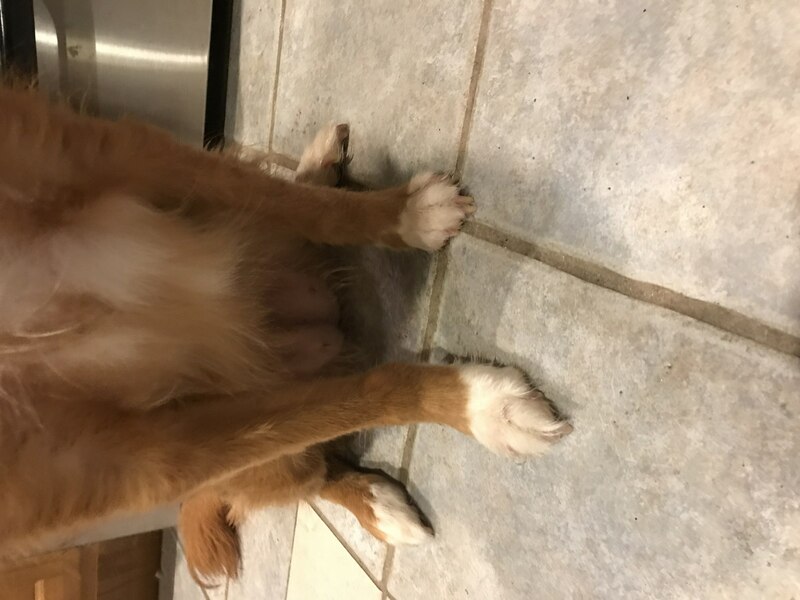 When I first was introduced to Tollers, I was aware that they could have auto immune problems, but I really didn’t understand what that could mean. I wasn’t too worried about it because I hadn’t heard of anyone speak of actual dogs who were affected and how that impacted their lives. My assumption was that as long as I supported my dogs’ immune systems with a good diet and supplements, they would be fine. How wrong I was….in August, 2017, my Nadia was diagnosed with Immune Mediated Polyarthritis. I am writing Nadia’s story hoping that will help others come to a diagnosis sooner, and also give hope that dogs with this condition can lead happy & energetic lives and still can be competitive in performance venues. 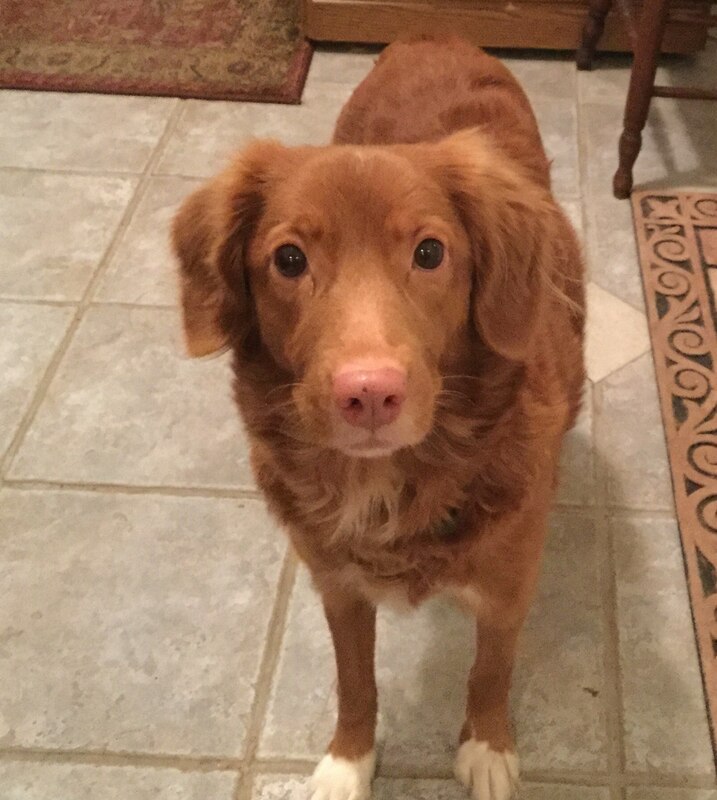 Nadia is a Nova Scotia Duck Tolling Retriever. She was always very healthy, fully of energy and her main goal in life is to find fun in everything she does. Her nickname is Naughty Nadia, and she strives to live up to her name. Never a dull moment living with her…..and then everything changed. She had a litter of puppies in November, 2015. She was not an attentive mother at all. She was aloof and more concerned with her toys than her puppies. I was thankful there were only 2 puppies because I did most of the work that the dam should do. I just chalked it up to her personality and a lack of maternal instinct. I had seen that before. Nine months after her puppies were born, she was back in the obedience ring and back in the Field. She began to have occasional ‘off ‘ days when she ran slowly, lacked energy and was not as interested in retrieving as she had been. I had a blood panel done and tested for tick borne diseases, and everything was normal. That summer she got her CDX, her WCI and her WCX. She also started competing in HRC Finished. She continued to be an amazing dog, despite the occasional off days. In October, 2016, she came into season (her second season since her puppies were weaned) By the third day, she seemed lethargic and I noticed a slight limp. I wondered if she had hurt herself jumping off the couch. 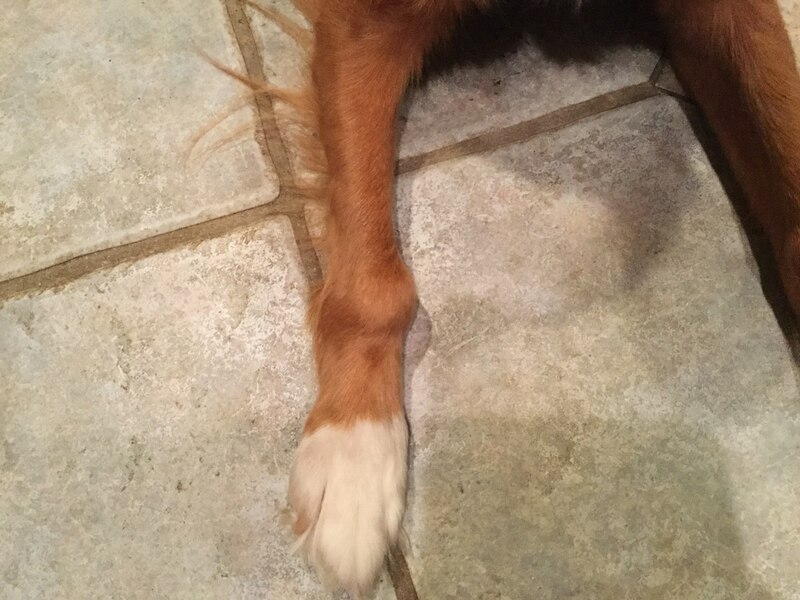 By the fifth day, she was lame and holding up her right front paw. I massaged it, put heat & ice on it, and made an appointment with my vet to see her on Monday. The next day, she stopped eating and I noticed a small lump on her rib cage, which appeared to be a bug bite. The following day, she had developed 7 more lumps that were the size of golf balls all over her body. She was drinking a lot and not eating. She could barely walk, and I had to hold her up to go to the bathroom. My first thought was cancer. Monday’s vet appointment revealed no answers. Her lumps were aspirated (and cytology was normal), Her bloodwork showed an elevated WBC. I had panels done for 15 tick borne diseases, and everything came up negative. We made plans to biopsy her lumps on Wednesday. My vet said that her lymph glands were extremely enlarged. X-rays were negative. By Wednesday, there were no lumps to be found on her body. There was nothing to biopsy. My vet was stumped. Everyone I spoke to was stumped…and the best guess was that she had Lyme or some other tick disease but it was not showing up on the tests. At Monday’s appointment, my vet put her on minocycline, and her symptoms disappeared. She was on the drug for a month, with significant improvement and no more lameness. Two days after the antibiotic was finished, she developed inflammation around her right carpal joint. It was hot to touch and she would not let me palpate it. She was non weight bearing on it. I took her back to the vet. X-rays were inconclusive, so we sought the second opinion of an orthopedist at a teaching hospital. Diagnosis was a soft tissue injury and she was destined for 6 weeks of crate rest. Well, she did not improve with crate rest, and the inflammation continued to increase. 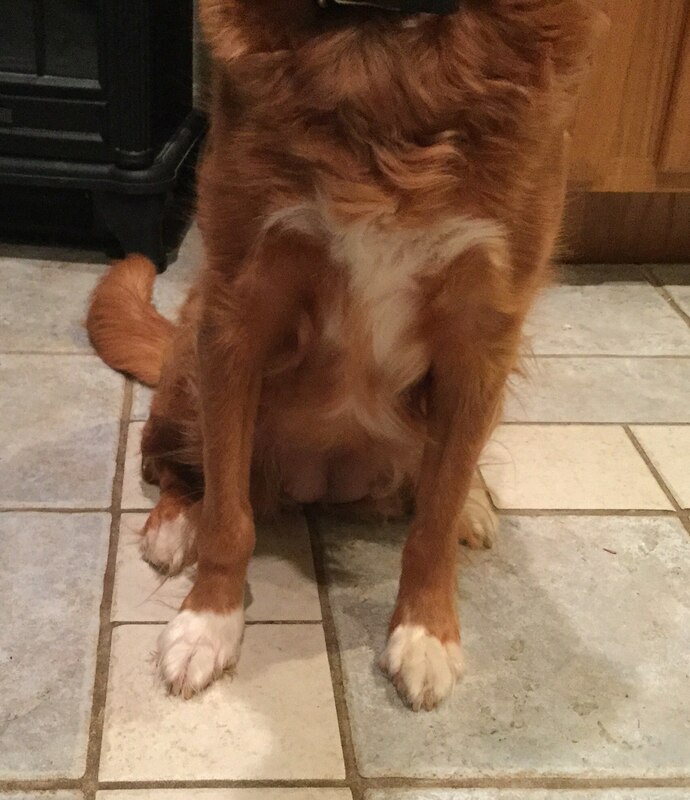 She also was losing weight…my 35 lb dog weighed barely 30 pounds and her hair was falling out in gobs. In January, we put her on another course of antibiotics and she improved some. 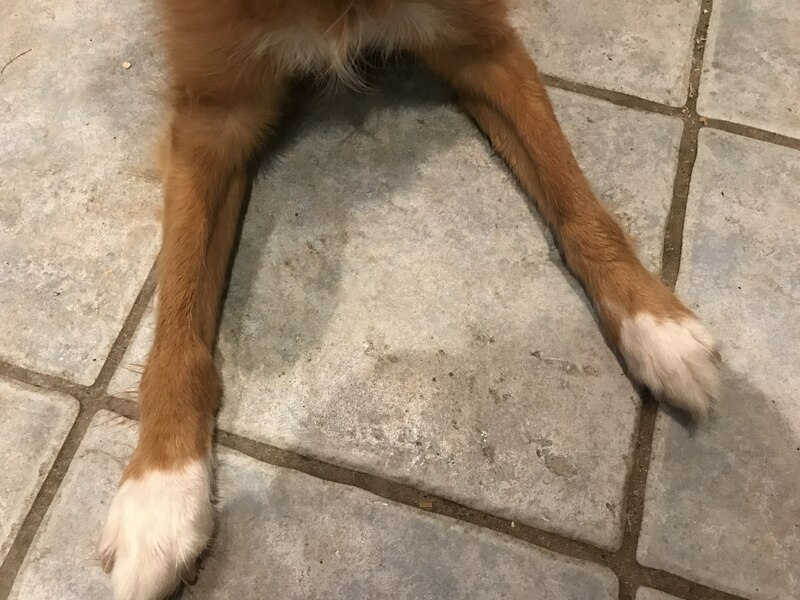 The swelling decreased and she became weight bearing, but that right leg was showing atrophy and the joint was still not normal. Lameness would come and go. I started her on the water treadmill twice per week and easy walking. She couldn’t even make it to the end of the driveway due to her panting and lameness. 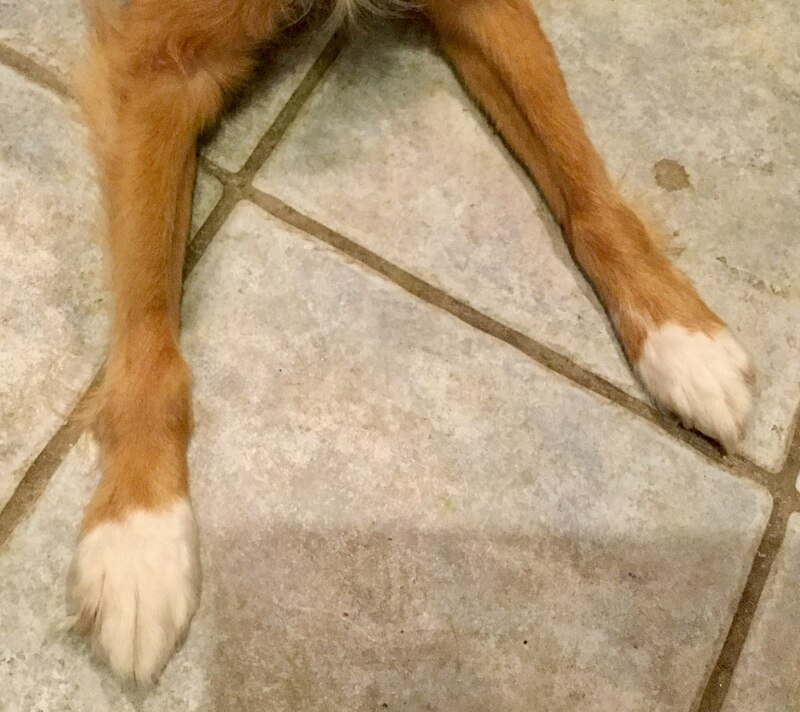 She seemed to be getting weaker all the time…and I really felt we were dealing with more than a tick disease, and certainly she did not have a soft tissue injury. She seemed to improve with the second round of antibiotics. My vet and I decided to spay her, since I would not be breeding her again and wondered if some of her issues were hormonally related. Her spay went well and she recovered easily. She had about 10 days of good mobility and then a bad relapse. Back on antibiotics, she improved. However, it was evident that the water treadmill was becoming more difficult for her, and she started to whine when we first started it. The next few months, I saw a steady decline in muscle strength, her attitude was dull, she slept a lot, and she did not seem to care about much. 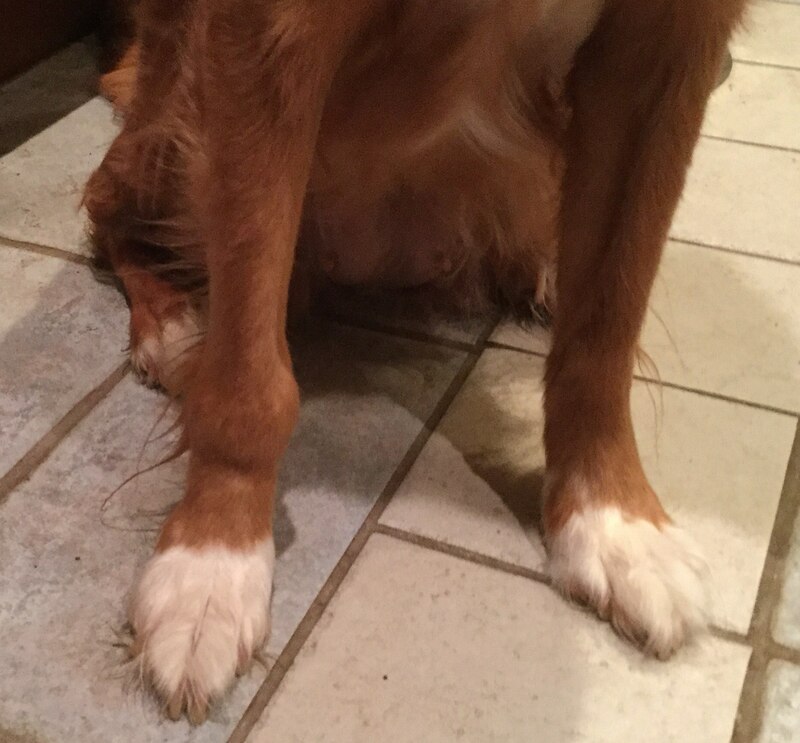 In July, her left rear leg became inflamed, and now she was on two legs. I felt like we were losing ground. It was then that we decided to see someone who specializes in auto immune disorders. In a week, we had an appointment with the internal medicine specialist. I took her off the anti inflammatories (Rimadyl, Golden Paste) and antibiotics a week before the exam. On first examination, I was told that the symptomology presented itself as tick borne disease. 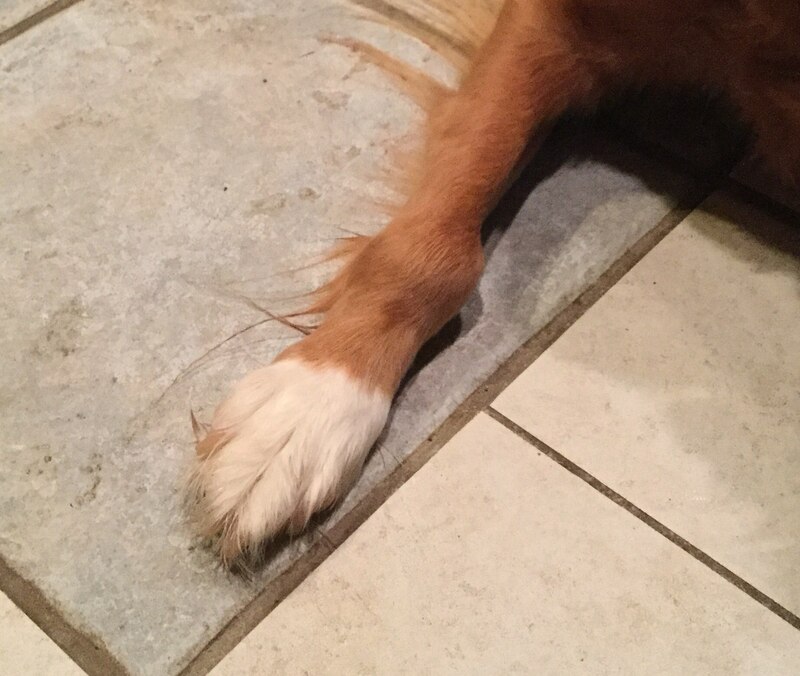 But, because of all the inconclusive medical testing (X ray, ultrasound, blood work, orthopedist evaluation ), interventions and continued decline, she wanted to a do a joint tap. I was elated, because that is what I wanted. I had to keep her off the Rimadyl until we got the test results back. If she needed to be on prednisone, she had to be off the Rimadyl for at least a week to prevent gastric ulcers. Test results were expected back on Tuesday, which was 5 days away. With each passing day, Nadia became worse. On Tuesday morning, she could not stand up. I had to pull her bed out of her crate with her on it and help her stand. She immediately toppled over and cried. My heart was broken. A few hours later, I got the news that she was diagnosed with Immune Mediated Polyarthritis (IMPA). Diagnosis really is by exclusion, and it took 9 months! Now that I had a diagnosis, it was time to learn about IMPA and how it was going to impact our lives. I learned that she was going to be on Prednisone, and slowly be weaned from it. The weaning process needs to be slow to prevent relapse. Vets were not giving me positive information about recovery…not even a glimmer of hope. However, I was amazed at the number of people who came forward to tell me that they have/had a dog with IMPA, and shared their story. I was given hope that she would live a happy life again and maybe she would be active again and show her starry self. That was in August, 2017. She started out on 20 mg per day of prednisone and gabopentin for pain. After a month, I took her off the gabapentin, and she had her first decrease of prednisone to 10 mg. Per day. It is now 6 months later and she is taking 5 mg. of prednisone 3 times per week! 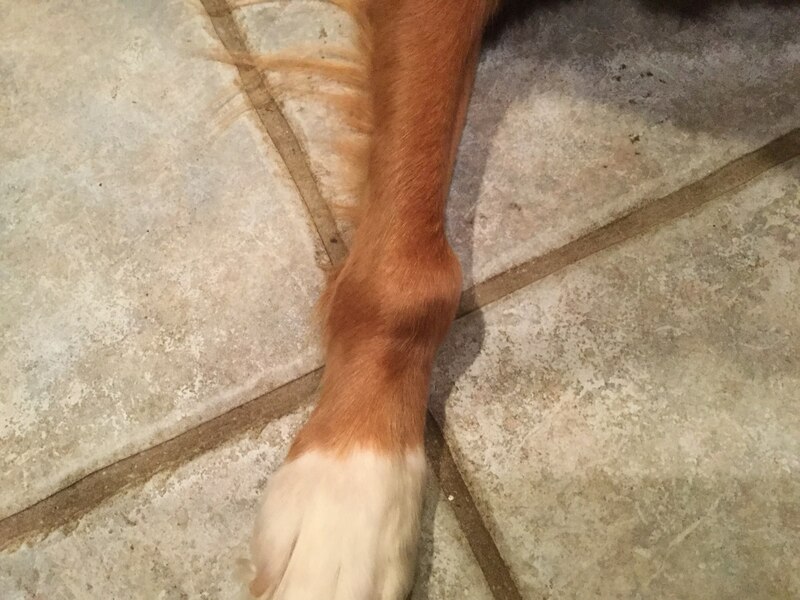 Her joint swelling is gone. She is running and playing and her attitude is back. She is full of fun and is starting to grow her hair back. Her treatment has been more than prednisone. It included a balance of acupuncture, diet, supplements, massage, and conditioning. Everything is done slowly, with patience, and careful observation. She is on a raw diet with ground chicken or turkey and cooked vegetables. Every day she gets a probiotic, (Fastrack) Phytoflex, and Golden Paste (made by me) On the days she takes pred, she gets Denamarin to protect her liver and Sufulcrate to prevent gastric ulcers. She is eating well and her weight is back up to 33 lbs. Her hair is growing back slowly. She walks on the indoor treadmill 2 – 3 times per week and swims in an indoor pool. I have to drag her out of the pool! She wants to play and even more important, she wants to work. I’ve started a basic conditioning program and reviewing her skills for obedience and Field. She might even try Dock Diving this year, like her son Alden. We certainly are not out of the woods, but I have learned a lot from Nadia and this experience. I learned how stoic a dog can be. I learned that she has a resilience to be envious of. This is a study in patience and determination. We have goals again, and she is obviously happy and pain free. Happy and pain free is the ultimate goal and the rest is icing on the cake. We will continue to decrease her prednisone slowly and increase her conditioning program. But in the meantime, we will enjoy our time together and have fun every day. That is what it should be all about! If you have any questions about IMPA or would like more information about Nadia’s condition, treatment and progress, I am happy to share what I know.